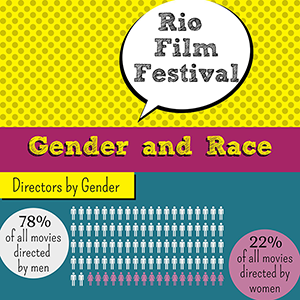 GEMAA has just published this new infographic of race and gender, with the profile of the films that will be displayed at Rio Film Festival. The infographic illustrates that white men are absolutely dominant in the context of the most important functions – direction, script and performance – and the same is repeated in the movies that will be displayed at the festival. Black men and women in all the movies in the sample were underrepresented, with only one black director.